One Bedroom Apartment facing Swimming Pool with Facilities to make you feel Like Home @ 3rd FloorThe apt has Wifi connectivity of 10Mb with TV (Njoi Channel). To make you feel comfortable, the apartment is equipped with air-con and fan in the Living Area as well as Bedroom. 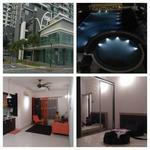 Swimming pool and gym located on 1st floor of the apartment for you.